So, a couple of years ago now, a bunch of friends who had been scribbling away on the odd story here, the odd story there, started talking more seriously about giving their work a bit more polish. And trying to get published. That bunch of friends were the merry crew that went on to create Inklings Press, and I was fortunate enough to be one of them. So was Brent A. Harris. I've known Brent probably around ten years now. We first met as deadly rivals, battling one another over the gaming table at Heroclix tournaments in the UK. I mocked his American accent. He snarled at the characters who made up my teams. You know how it goes. Brent was the first of the Inklings crew to turn his short story scratchings into something more substantial. And today, well... take a look at the image below. That's right. Today's the day for Brent's novel to be published. I can't imagine how nervous, how excited he is right now. He's laboured at this novel for more than two years - and finally, here it is. Publication day. Like the birth of a newborn baby. It's a real treat as a read, too. I've had the benefit of reading much of it during his progress - and the clash of a time-flipped George Washington and Benedict Arnold is a scintillating one. We get to know who they are, why they care, why they made the choices they made in this world of alternative history. Alternative history is very much Brent's genre. He was nominated for the Sidewise Award this year for his story Twilight of the Mesozoic Moon, co-written with Ricardo Victoria. That saw him listed alongside Bruce Sterling, of all folks, whose Pirate Nation tale was also nominated. The genre of alternative history isn't just about the moment where history changed, but the consequences that flow from it - and that's what A Time Of Need explores. You feel the icy waters that soldiers wade through, you sense the tension in the Philadelphia otherworld where politics and treachery rub shoulders. 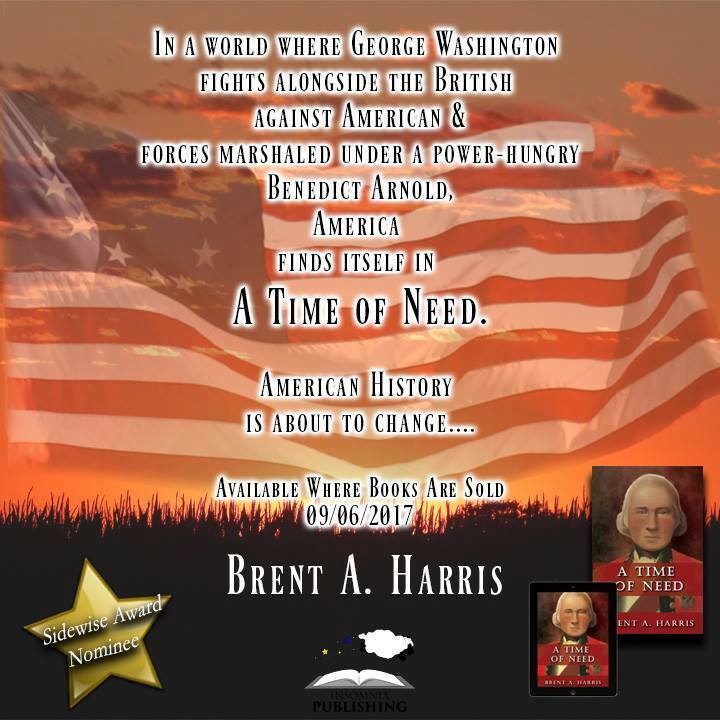 I most enjoyed the co-stars of the book, the soldiers who fought alongside either Washington or Arnold, and the conflicts they get drawn into. It's not just the famous figures left with tough choices - and we really see a soldier's view of the war. Sometimes in life, we look back and see the outcome of wars as inevitable. This side would always win. That side would always lose. That's never the case for the soldier on the battlefield, who is fighting to survive in the blood and confusion. And it's not the case in this alternate world where we don't know the outcome. The past has changed, the future is uncertain - and America will never be the same again. A Time Of Need is available on Amazon today, published by Insomnia Publishing - here's the early link, though I'll update this later as Amazon's algorithms click into place. UPDATE: The ebook is now available from the Insomnia Publishing site. And if you've read this? Do me a favour - it really is a magic moment for an author for their book baby to be born. Go on over to Twitter and wish Brent good luck. He's @BrentAHarris1 on Twitter. Maybe throw him a retweet of his new book while you're there. If you're not on Twitter, feel free to drop a comment below, I'm sure he'll see it. Meanwhile, I'll go back to plotting his downfall for next time we meet over the gaming table.